The first tender spears of asparagus are always a welcome sight at the farmers market, a sign that spring is on its way. But some of that seasonal excitement is fading, now that bunches can be found on grocery store shelves throughout the winter. “Asparagus has become available year round, whereas before it was just a springtime crop in the United States,” says Roscoe Zuckerman of Zuckerman’s Farm, whose asparagus season typically runs about 16 weeks, from February through May. The recent influx of Mexican asparagus has farmers like Roscoe worried about the future. A fourth-generation asparagus and potato grower in Stockton, he farms about 260 acres of asparagus, a number that has been decreasing over the years as the wholesale market has shifted. His grandfather once grew 4,500 acres of green and white spears. Because the costs of harvest are so high, he has been cutting his losses by doing something no farmer wants to do: disking viable crop, which means cutting spears and leaving them in the field. “How can you grow a crop and not be able to sell it?” he laments. Asparagus was first planted in California in the 1850s in the fertile Sacramento-San Joaquin River Delta, and the state still leads the nation in asparagus production. But acreage has been in decline in recent years. According to the National Agricultural Statistics Service, there were 12,000 acres of asparagus in 2012, down from 29,000 in 2003. “The asparagus industry in our area is dying a slow death,” says Roscoe. Over the last two decades, free trade agreements like NAFTA have contributed to this shift, dramatically changing what’s on the American plate. The glut of imports has created a year-round expectation for cheap asparagus, tomatoes, raspberries, and other seasonal crops. While global trade seems like a win in terms of food availability and access, particularly in colder parts of the US, the elimination of tariffs means that wholesale prices have fallen, making it difficult for US growers to compete with countries like Mexico and Peru. Today, more and more Americans are eating asparagus, but it is estimated that imports make up as much as 90 percent of the market. Though it is referred to in the industry simply at “grass,” asparagus has historically been considered an aristocrat of the plant kingdom, commanding higher prices than most vegetables. Few consumers understand the patience and hard work that go into growing this unusual perennial crop. Planting asparagus “crowns” is a significant time investment for farmers, as new plants must establish themselves for two or three years in the ground before producing harvestable shoots. Once mature, the plants may be harvested for up to 20 years, but only about half a pound of spears may be picked from each plant over the course of a season. On hot days, asparagus can grow upwards of 7 inches a day, which means that Roscoe may be sending workers out into the field to harvest from the same plants within 18 to 24 hours. Harvesting asparagus is one of the more labor-intensive jobs in agriculture. Roscoe estimates that every spear is touched by human hands about 20 times from field to market, as it is cut, picked up, passed down rows, put in piles, and eventually sorted by size in the packing shed. Thick shoots come from younger, stronger plants, while the thin shoots are from older plants. 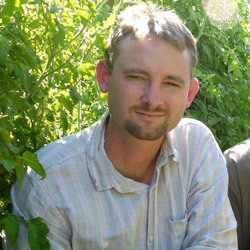 Second-generation farmer Thaddeus Barsotti of Capay Organic, which grows 60 acres of organic asparagus for direct sales as well as wholesale markets, estimates that his asparagus harvest costs are 30 to 50% of the total production cost. A discrepancy in labor standards is a significant factor in the higher price of locally grown asparagus. Zuckerman’s conventionally grown asparagus sells for $3.50 a bunch at the farmers market, while Capay’s organic asparagus is $5. “In California, we’re required to pay minimum wage and we have Cal/OSHA responsibilities,” explains Thaddeus. “These things are important, and they are also expensive.” According to Roscoe, a Mexican laborer gets paid $10 a day. 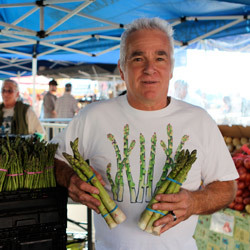 In a depressed wholesale asparagus market, both Zuckerman’s Farm and Capay Organic rely heavily on farmers markets and CSAs to keep their sales afloat. “The only business that I can make money at is farmers markets, which includes restaurant trade,” says Roscoe. He estimates that farmers markets make up half of his business. Farmers markets also offer the opportunity to communicate the freshness of a locally grown product that is harvested the day before market, in contrast to asparagus that has traveled thousands of miles and may be a week old before it hits market shelves. Support Zuckerman’s Farm on Saturday, Tuesday, and Thursday and Capay Organic on Saturday at the Ferry Plaza Farmers Market. See for yourself how Zuckerman’s asparagus is grown and harvested on our next farm tour on April 13. Buy tickets now. Roscoe Zuckerman photo by Tory Putnam. Thaddeus Barsotti photo courtesy of Capay Organic.